Helmut LACHENMANN (b. 27 November 1935, Stuttgart). German composer of mostly orchestral, chamber and piano works that have been performed throughout the world. 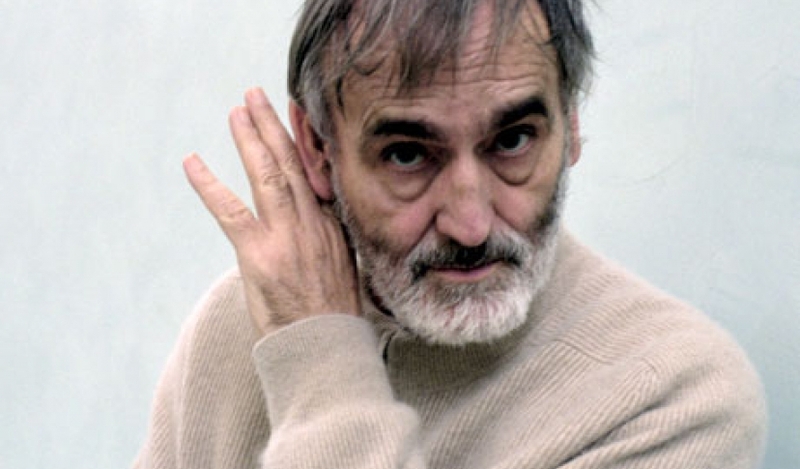 Prof. Lachenmann studied composition and music theory with Johann Nepomuk David and piano with Jürgen Uhde at the Staatliche Hochschule für Musik und darstellende Kunst Stuttgart from 1955–58 and composition privately with Luigi Nono in Venice from 1958–60. He later studied at the Instituut voor Psychoacustica en Elektronische Muziek (IPEM) at the Universiteit Gent in 1965. He received an honorary doctorate from the Hochschule für Musik, Theater und Medien Hannover in 2001, an honorary doctorate from the Hochschule für Musik Carl Maria von Weber in Dresden in 2010 and an honorary doctorate from the Hochschule für Musik und Tanz in Cologne in 2012. Among his honours are the Kulturpreis für Musik from the city of Munich (1965), the Kompositionspreis from the city of Stuttgart (1968, for Consolation I), the Bach-Preis der Freien und Hansestadt Hamburg (1972), the Ernst von Siemens Musikpreis (1997), the Royal Philharmonic Society Music Award for Chamber-Scale Composition (2004, for III. Streichquartett, 'Grido'), the Berliner Kunstpreis from the Akademie der Künste in Berlin (2008), the Leone d'oro alla carriera from the Biennale di Venezia (2008), and the Verdienstkreuz 1. Klasse des Verdienstordens from the government of Germany (2010). He was later named Commandeur des Arts et des Lettres by the government of France (2012). He is a member of the Akademie der Künste in Berlin, the Bayerische Akademie der Schönen Künste in Munich, the Freie Akademie der Künste in Hamburg, the Freie Akademie der Künste Rhein-Neckar in Mannheim, the Freie Akademie der Künste zu Leipzig, and the Koninklijke Vlaamse Academie van België voor Wetenschappen en Kunsten. He is the subject of several publications, including Helmut Lachenmann–Inward Beauty (2004, edited by Dan Albertson, Contemporary Music Review) and Helmut Lachenmann–Music with Matches(2005, edited by Dan Albertson, Contemporary Music Review), as well as the film ...Wo ich noch nie war: Der Komponist Helmut Lachenmann by Bettina Ehrhardt (2006). He is also active in other positions. He has written numerous articles on aesthetics, many of which appear in the collection Musik als existentielle Erfahrung – Schriften 1966–1995 (1996, second edition 2004, edited by Josef Häusler, Breitkopf & Härtel). He taught at the Staatliche Hochschule für Musik und darstellende Kunst Stuttgart from 1966–70, the Pädagogische Hochschule Ludwigsburg from 1970–76, the Universität Basel in 1972–73, and the Hochschule für Musik, Theater und Medien Hannover from 1976–81. He has lectured regularly at the Ferienkurse in Darmstadt since 1978 and taught as Professor für Komposition at the Staatliche Hochschule für Musik und darstellende Kunst Stuttgart from 1981–99. In addition, he has lectured in Argentina, Austria, Brazil, Canada, Chile, China, the Dominican Republic, France, Germany, Japan, Mexico, the Netherlands, Norway, Russia, Spain, Switzerland, and the USA. He is married to the pianist Yukiko Sugawara. His publisher is Breitkopf & Härtel.